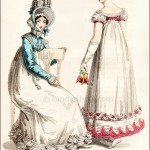 Lady’s Monthly Museum, April 1806. One detail of this print has always intrigued me. The eyes of the lady on the right look to be framed in rather exotic eye shadow. Sometimes such details are penciled in by previous owners (I have one lovely print from 1808 where someone has added a smoking cigarette in the mouth of one of the ladies!) But close examination here shows this Egyptian-looking eye shadow is original to the print. Very odd. Note also that the purse she is holding is called a ridicule. That was the term used at this time. 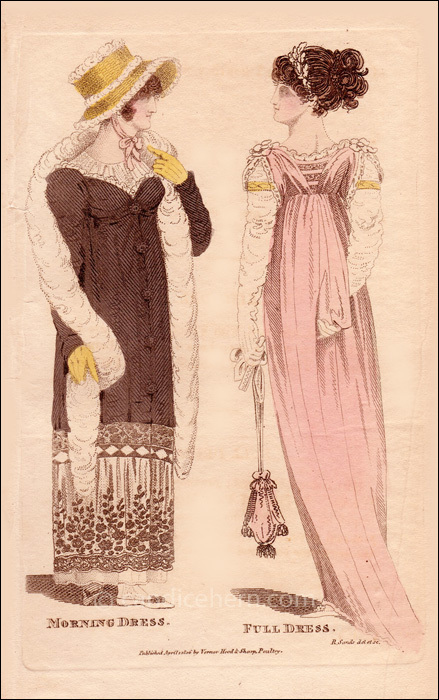 The better known bastardized version of the word, reticule, did not come into general use until the late 1820s or early 1830s. “WALKING DRESS. Straw Hat, trimmed with Swansdown. Pelisse of Black Velvet, with a deep Lace round the Bottom. Swansdown tippet. Half Habit Shirt. Buff Gloves.